On the eve of October 19, 2015, a young Somali woman called me from Toronto, Canada. Still winding down from my daily commute, I reluctantly answered the phone and inquired who the caller was? “You don’t know me, Faisal, but I am a big fan of yours,” said the voice of a young Somali in a state of excitement. “Yes, how can I help you?” I retorted. She implored if I can generously give her 1 or 2 minutes of my time? “Yes, Please go ahead,” grudgingly I answered. Instantly my brain was awash with history, memory, hope and nationhood. The words the young lady sung over the phone were words of triumph. We Somalis genuinely sung these words in unison over 55 years ago, the eve of our independence. In that eventful night in 1960, the blue flag, or Bluugley, with its indomitable bright white start sitting in the center lit up the heavenly skies that engulf the expansive Somali—inhabited regions in Horn of Africa. It was a moment of limitless hope and imagination for an entire people. The caller from Toronto likened her feelings on this unprecedented historic moment to the memories of 1960. Once she told me the context of her short song, I as matter of fact joined her, despite my coarse voice, and for few more minutes remained oblivious to my Cadaan friends and neighbors around me. 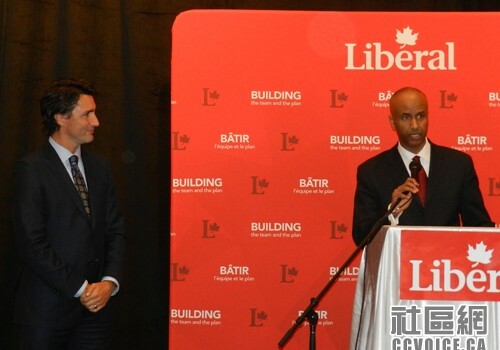 Ahmed Hussen’s landslide election (he won almost 50% of the votes in a crowded field) to the prestigious Canadian Parliament fills my own void – a void created by the destruction of the Somali state. In other words, his inspiring victory reminded me and millions of Somalis that we are not dead as a people; rather we are dusting off of the ashes that the fallen Somali flag. In a strange way, Ahmed’s success reaffirmed my own resilient believe that Somalis throughout history had fallen down momentarily, dusted off, stood up, and then went ahead to achieve great things (Soomaalidu tan iyo Axmed Guray waa kaacaa-kuf). If Somalia’s 1960 republic is destroyed internally by ignorant and egoistic elites, Somali-ness is fully energized externally by clean and vibrant generation of Somalis; Ahmed is a prime example of the latter. Sharing the liberal agenda with Canada’s most famous son, Justin Trudeau, our young sons and daughters in the future can no longer be likened to Al Shabab but to the name of Trudeau family. That very shift in name association between Ahmed and Justin Trudeau would certainly have huge import for our people and its communities in the diaspora. I suspect it is because of what amounts to be a sea change in our reputation that prompted the young caller from Toronto to recite those glorious hymns. Likewise we all are singing “maanta maantaa…” from coast to coast. Having spent the first part of my life living in Somalia, Canada was a beacon of light. I came to Canada in 1993 as a refugee, and was welcomed with open arms. Coming to Canada was not just an opportunity to feel safe — it quickly became home. Sadly, our nation has lost its way. Over the last decade, Canada has slowly moved away from the welcoming nation that I landed. It is time we return Canada’s respect on the global stage, while ensuring that we treat our fellow residents with dignity and respect. It is time we end the Conservative decade of failure, and restore fairness to Canada’s immigration and refugee system. As a refugee who found a better life in Canada, I hope that we can once again ensure that opportunities are available to people as they were available to me. Canada can and must do better. With such a raw determination, in his own way Ahmed helped end the conservative era. Canada is back. As one of my face book friends wrote on my page the night of the election (Abdinasir Issa-Xaabsay), Ahmed Hussen’s victory over John, James, Steve, and Mike, is telling of the success of Canada’s multi-culturalism. Abdinasir Issa-Xaabsy could as well have said where else but in Canada can Ahmed defeat old dead white men like John, Steve and similar names. Ahmed’s victory is equally a Somali narrative, because in him we have someone to point at when we tell our youth that the sky is the limit. America’s first Muslim Presidential hopeful, the 10-year-old Caduur from Minnesota , who challenged and corrected a conservative presidential candidate in the US, Ben Carson, can now have someone to write his essay about and still look up to him as a role model. On this day of October 19, 2015, a shining northern star positively reconfirms our existence and tells the world that we are not Al-Shabaab but a community of decent workers, nurses, accountants, planners, doctors, lawyers, Minnesota’s first black City Council member (honorable Abdi Warsame), and now a parliamentarian in Canada. Ahmed is the first Somali ever to be elected to such a position in one of the most powerful nations on earth. It is a big deal for all of us. Emigrated from Somalia to Canada in 1993, following a devastating civil war in his home country, Ahmed studied and subsequently practiced public interest law. He also remained an advocate for immigrants. For many years he has been the National President of the Canadian Somali Congress – Somali community organizations that advocated on issues of importance to Canadians of Somali origin on civic engagement and integration. He is a father of two. Faisal Roble is a writer, political analyst and a former Editor-in-Chief of WardheerNews, mainly interested in the Horn of Africa region. He is currently the Principle Planner for the City of Los Angeles in charge of Master Planning, Economic Development and Project Implementation Division.